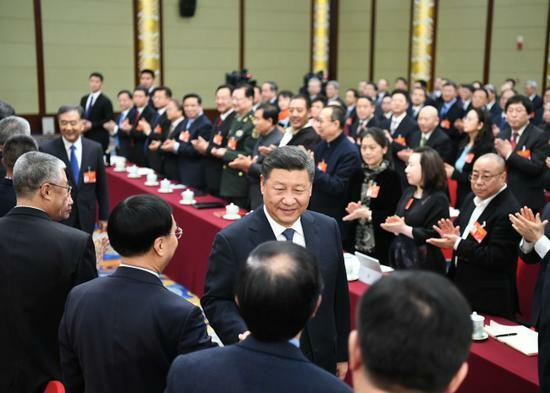 Xi, also general secretary of the Communist Party of China Central Committee and chairman of the Central Military Commission, said this when joining a joint panel discussion attended by political advisors from the sectors of culture and art, and social sciences. They are in Beijing for the annual session of the Chinese People's Political Consultative Conference (CPPCC). President Xi first listened to the remarks of eight CPPCC members who spoke about diverse issues including the role of museums, the innovation of artistic and cultural creation and the building of a philosophy and social sciences with Chinese characteristics. "Professionals in the sectors of culture, art, philosophy and social sciences are important soul builders," President Xi said. He urged professionals in these sectors to adhere to a people-centered approach, stay in close touch with the people and reflect their lives and voices in their works. President Xi also called on Chinese artists and social scientists to keep pace with the times and base their work on China's new era, present historic changes in the era, and find answers to questions relevant to the era. "All valuable and meaningful work in cultural and artistic creation and academic research should reflect the reality and highlight the reality," he said. "It should be conducive to resolving real issues and answering real questions." Xi added that consensus is the driver of progress and that wisdom from across the nation needs to be pooled for the realization of the two centenary goals and the Chinese dream of national rejuvenation. He expressed the hope that CPPCC members will play leading roles in this process and live up to people’s expectations. This year marks the 70th anniversary of the founding of the People's Republic of China. Xi called on the attendees to profoundly reflect the struggles and practice of the Party and the people over the past 70 years. Commenting on Xi's words, Zhang Jianguo, a CPPCC member and Peking opera star, said what impressed him most was Xi's emphasis on the close relations between creative work and the people. An artist cannot produce great work without a deep understanding of people's lives, he noted. Feng Yuanzheng, another CPPCC member and a famous actor, echoed Zhang’s views. The principle “All for the people” is the first objective of a good cultural worker and needs to be passed down from one generation to another, Feng said. Talking about outstanding works, CPPCC member and household name Jackie Chan cited China’s high-tech movie The Wandering Earth that hit the screen earlier this year. “Many of my foreign friends are surprised that Chinese people have produced such a movie. I’m very happy that The Wandering Earth sold well and that we also have the capacity to churn out high-tech movies,” said Chan.